Life in London, Paris and Auckland, and the places in between. For those of you who haven’t yet come across Pat or her photography and philosophy blog, Singleforareason, you should visit it right NOW. If I ever finish writing my foodie memoir, I’d love Pat to illustrate it – her photos of plants and fruit and vegetables and other fridge contents really get me going. 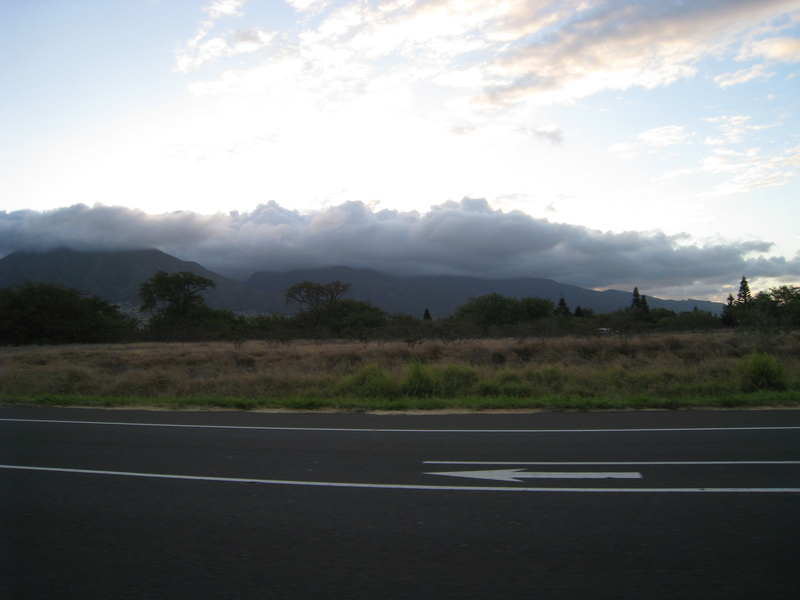 She also takes the most eerie photos whilst driving, and this inspired me to attempt the same while Monsieur and I were in Maui earlier this year. The only difference was that Monsieur was driving whilst I was photographing. Pat manages to do both at the same time. Those clouds above the mountains stay above the mountains. Down on the West coast, where most of the main resorts are, it hardly ever rains. 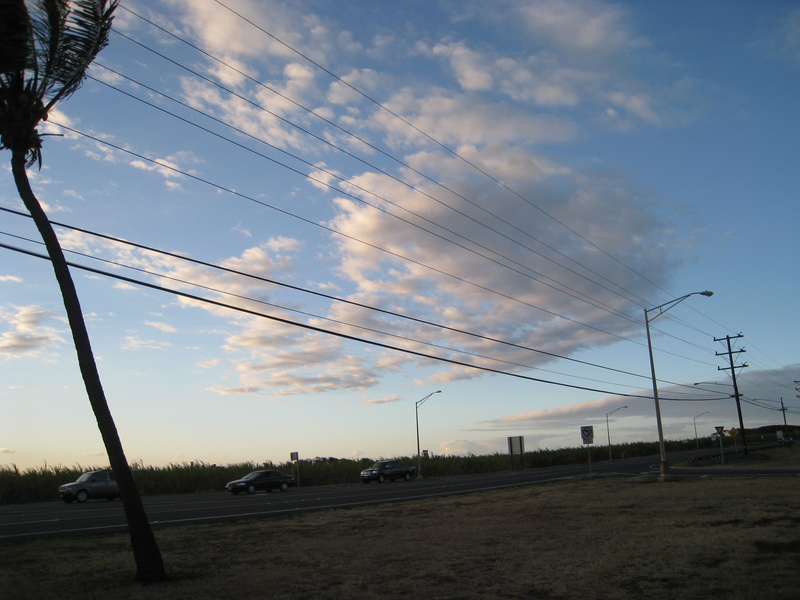 All the palm trees in Maui are bent in the direction of the dominant wind. The first bent palms we saw were just outside the airport. This one was a bit lonely, stood by the side of the road in the middle of sugar cane country. 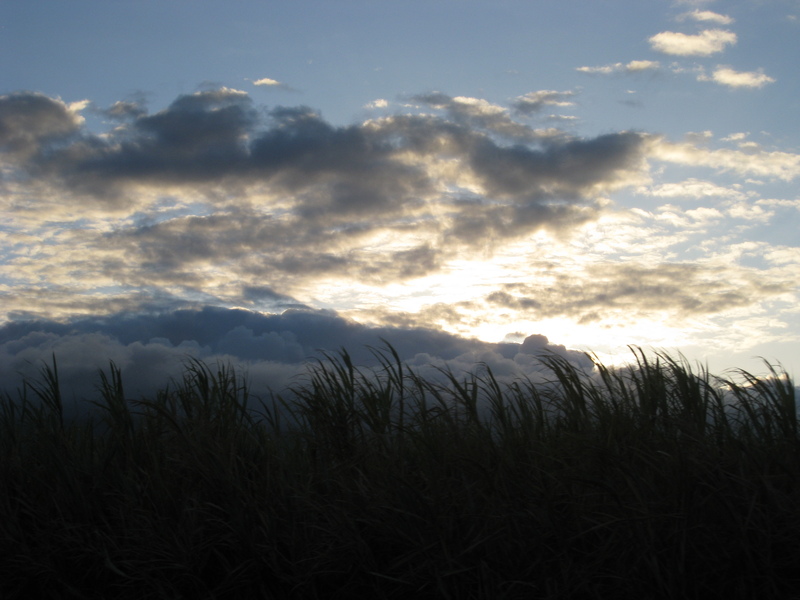 Sugar cane and ominous clouds that threaten but never quite reach us. 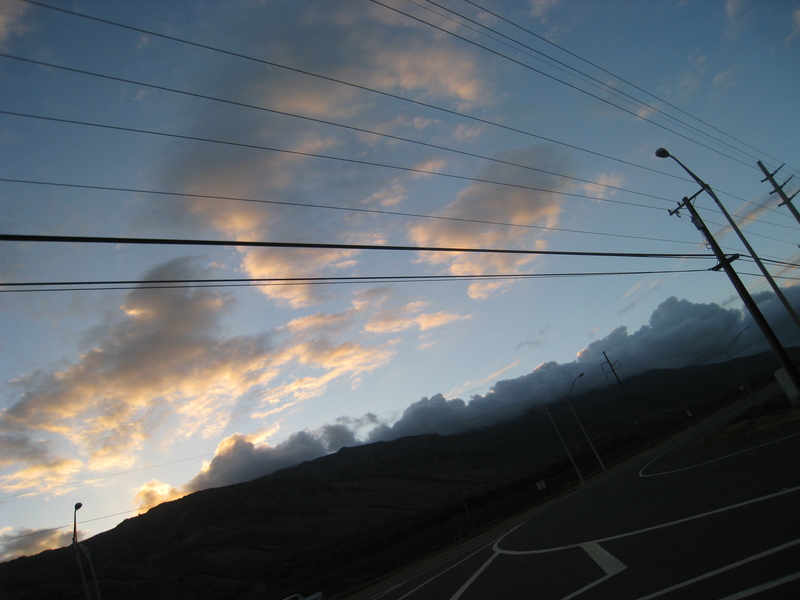 The Maui skies are huge and the landscape dramatically craggy from its volcanic heritage. 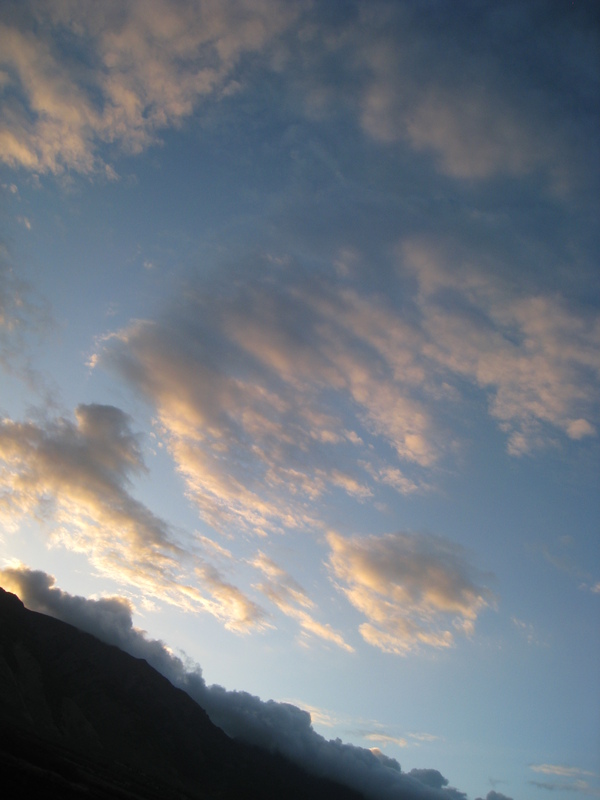 The sun sets early here. It’s already hiding behind the mountains but hasn’t quite gone. 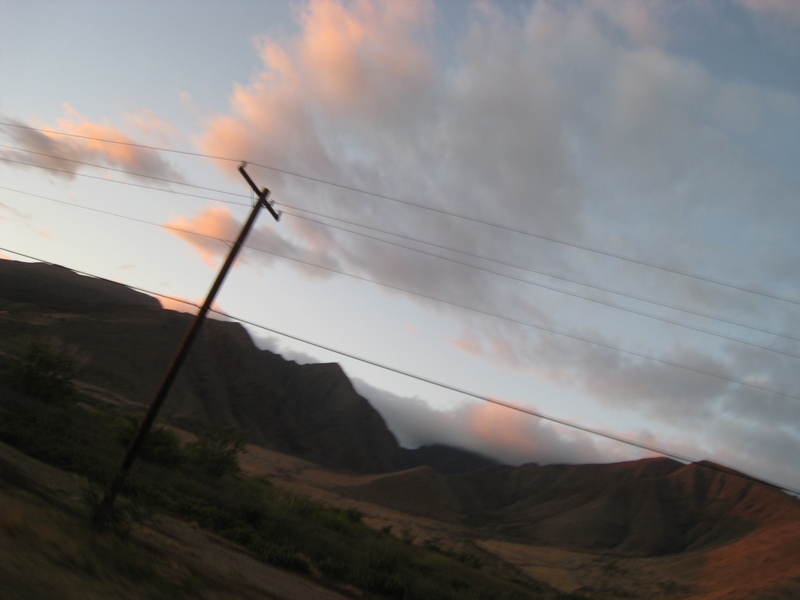 Just south of Lahaina the hills are terracotta and ancient-looking. The sky begins to blush as the sun drops closer to the horizon. 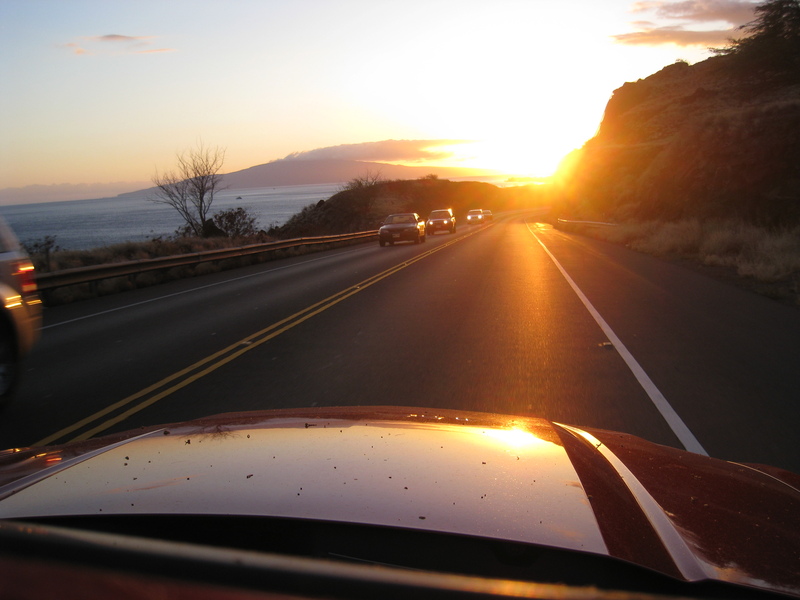 Its glow bounces off our shiny red Mustang as we head back up to Ka’anapali Beach and our hotel. It will be another postcard perfect evening for us as we watch the colours change around the neighbouring islands. Monsieur thinks I’m nuts to sit in the car taking photos as we whizz around the island – nothing new there. I think it’s fun and will definitely do this again. It gives a whole new perspective on our surroundings. Thank you, Pat, for the inspiration. Previous Post Dining Success at Borgnefesse! Epic! This is fun and a safe venture, too!! Now, I don’t often say this BUT having a driver is great reason to have a Monsieur in the house! I am going to NYC next week and there’s an exhibit at the Whitney of Lee Friedlander’s photos called “America by Car”!! ( http://whitney.org/Exhibitions/LeeFriedlander ) Tell Monsieur the next time he calls you “nuts” that you are working on your exhibit for the Whitney. Pat – excellent excellent idea! Shame we’ve run out of annual leave this year or I’d tell Monsieur that I need to go on a field trip. To the Whitney. I wonder what he’d say? Epic, while in NYC I went to a restaurant called, “Centolire” on Madison and 86th, I think. Short Ribs, Brussels Sprouts, Mashed potatoes. O, sweet universe, it was delicious. I read about it in Anthony Boudain’s book. My cousin had pasta bolagnes (sp?). She said it was the most delicious thing she’d ever had! When you go back to NYC, give it a try!! We also went to the Four Seasons! The waiters were older than me!! Re: the Four Seasons’ waiters – I always feel strangely comforted to be looked after by a career waiter. Their knowledge of food and wine is encyclopaedic. No running back and forth to the kitchen to check facts or what the vegetables of the day are or what ingredients are in a certain sauce. They definitely earn their tips, those folk.